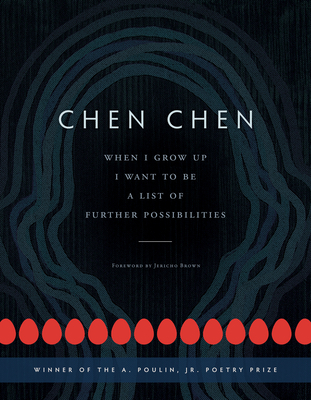 ON NPR BOOKS'S LIST OF "POETRY TO PAY ATTENTION TO: 2017'S BEST VERSE"
In this ferocious and tender debut, Chen Chen investigates inherited forms of love and family--the strained relationship between a mother and son, the cost of necessary goodbyes--all from Asian American, immigrant, and queer perspectives. Holding all accountable, this collection fully embraces the loss, grief, and abundant joy that come with charting one's own path in identity, life, and love. Chen Chen was born in Xiamen, China, and grew up in Massachusetts. His work has appeared in two chapbooks and in such publications as Poetry, Gulf Coast, Indiana Review, Best of the Net, and The Best American Poetry. The recipient of the 2016 A. Poulin, Jr. Poetry Prize, he has been awarded fellowships from Kundiman, the Saltonstall Foundation, Lambda Literary, and in 2015, he was a finalist for the Ruth Lilly and Dorothy Sargent Rosenberg Poetry Fellowships. He earned his BA at Hampshire College and his MFA at Syracuse University. Currently, he is pursuing a PhD in English and Creative Writing at Texas Tech University. Chen lives in Lubbock, Texas, with his partner, Jeff Gilbert, and their pug dog, Rupert Giles. Chen Chen was born in Xiamen, China, and grew up in Massachusetts. His work has appeared in two chapbooks and in such publications as Poetry, Gulf Coast, Indiana Review, Best of the Net, and The Best American Poetry. The recipient of the 2016 A. Poulin, Jr. Poetry Prize, he has been awarded fellowships from Kundiman, the Saltonstall Foundation, Lambda Literary, and in 2015, he was a finalist for the Ruth Lilly and Dorothy Sargent Rosenberg Poetry Fellowships. He earned his BA at Hampshire College and his MFA at Syracuse University. Currently, he is pursuing a PhD in English and Creative Writing at Texas Tech University. Chen lives in Lubbock, Texas, with his partner, Jeff Gilbert, and their pug dog, Rupert Giles. Jericho Brown is the recipient of the Whiting Writers Award and fellowships from the Radcliffe Institute for Advanced Study at Harvard University and the National Endowment for the Arts. His first book, Please (New Issues, 2008), won the American Book Award, and his second book, The New Testament (Copper Canyon, 2014), was named one of the best poetry books of the year by Library Journal. His poems have appeared in The Nation, The New Republic, The New Yorker, and The Best American Poetry. Brown earned a PhD from the University of Houston, an MFA from the University of New Orleans, and a BA from Dillard University. He is an assistant professor in the creative writing program at Emory University in Atlanta.